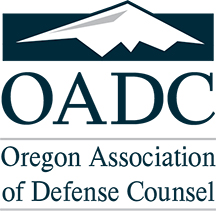 The Oregon Association of Defense Counsel is a non-profit membership organization for defense-oriented civil litigators as well as business and commercial litigators. For over 50 years, the Oregon Association of Defense Counsel has served as a unified voice for its members, offering valuable networking opportunities, and providing excellent continuing legal education. Our purpose is to increase the professional skill and knowledge of our members, enhance the services of the legal profession to the public, to improve the adversary system, and to work for the prompt and fair disposition of disputes. Join almost 600 trial attorneys defending civil cases and representing the interests of business and government in the courts of Oregon. Click here to see our 50th Anniversary tribute video and slide show. Make an impact on the civil justice system -- join OADC today.